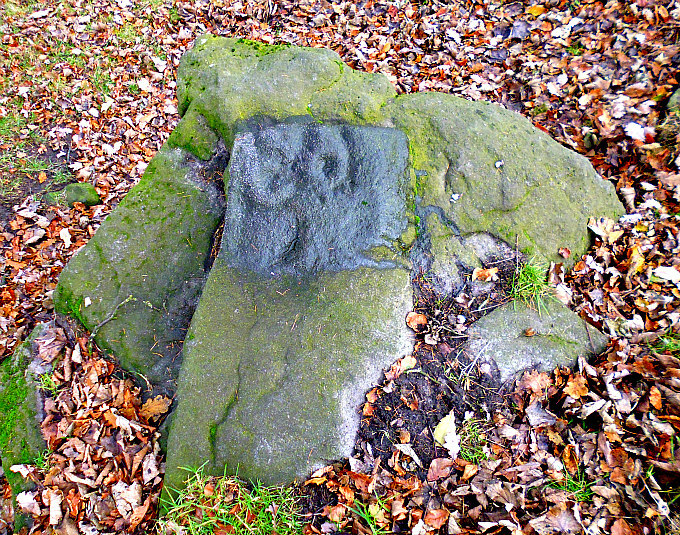 Currer Woods Rock Carving, near Eastburn, West Yorkshire. OS grid reference: SE 02514 43844. A very strange little rock carving almost hidden away in a secluded corner of a field at the southern edge of Currer Woods, at Steeton, west Yorkshire. This seems to be one on its own, and there don’t appear to be any other carvings at this location, although you never know. To reach the stone carving walk up the footpath on the opposite side of the B6265 road from Airedale Hospital in Steeton; the path runs south up to the western edge of Currer Woods. Or you can reach it via Redcar Lane and then Intake Lane: take that same foot-path from the stile beside the rough track; going down the slope for a while, then via off north-east along the edge of Currer Woods and through the field with rocks; the carving is in the next field along, close to the wall, in what is a secluded corner with trees over-hanging the site. 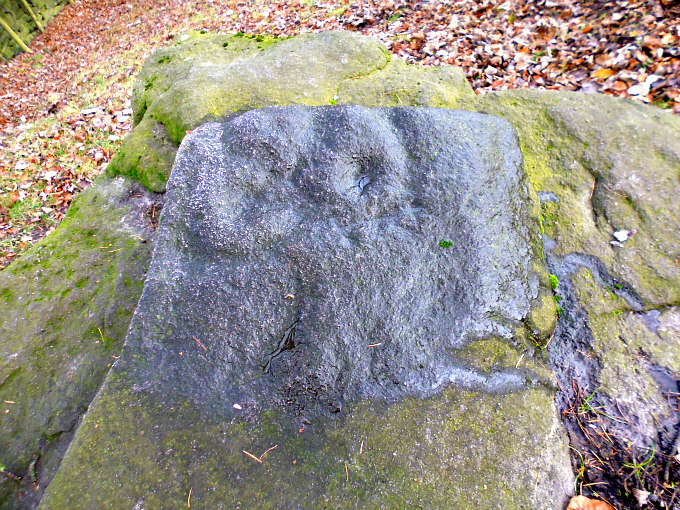 Close up of the Currer Woods Rock Carving, near Eastburn. This interesting little rock carving can be found on a cluster of gritstone rocks close to a wall and just out of the tree-line. It would seem that the rock upon which the carving is situated has suffered from damage by being broken off in two or three places at one end, but thankfully the carving, which consists of maybe two or three tiny cup-marks which are partially surrounded by half rings or arcs, has not been destroyed and seems to be intact. From a distance it has the appearance of a face with eyes and a nose – the nose being formed by a notch just below but whether this was part of the original carving – I don’t know. It might be part of the stone itself? Or maybe it was meant to be. It was discovered in 2009 by Paul Bennett of ‘The Northern Antiquarian’, whilst taking shelter from heavy rain! But for the rain it might never have been spotted. (See the link below). There do not appear to be any more rock carvings here, but further to the west (220m) on the slope above Eastburn Crags there might be a few “possible” cup-markings but these look to be more recent in date, and others have probably been caused by erosion. I have not, as yet, investigated any of the large moss-covered rocks in Currer Woods itself. Categories: Cup-And-Ring Markings | Tags: Currer Woods Rock Carving at Steeton And Eastburn in West Yorkshire | Permalink.